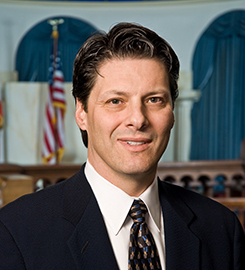 Devitt was the managing partner of his former law firm where he practiced complex civil litigation in various jurisdictions around the United States. He was lead counsel in several high-profile cases dealing with fraudulent financial reporting, which have resulted in hundreds of millions of dollars in combined recoveries. He is a frequent lecturer on evidence, financial reporting, accounting, litigation, ethics and other topics. His practical experience also includes sitting on the board of directors and audit committee of a public company and serving as an arbitrator in both federal and state court proceedings. Devitt is the executive director of USD’s Appellate Clinic. He received USD School of Law's award for excellence in teaching in 2010 and 2012. “Improper Deportation of Legal Permanent Residents: The U.S. Government's Mischaracterization of the Supreme Court's Decision in Nijhawan v. Holder” in 15 International Law Journal 1 (2013). Submit changes to Michael Devitt's profile.